This article has been seen 20866 times. INGREDIENTS: 100% natural, wild harvested Siberian Cedar resin. 100% natural, wild harvested Siberian Cranberry flour. The inhabitants of Siberia believe that Cedar Resin (Pine Resin) with Cranberry has great healing power, and has rightfully been called zhivitsa - related to zhizn, the Russian word for life - for its ability to heal wounds. The inhabitants of Siberia and the Urals long ago discovered the therapeutic anesthetizing properties of this resin. There is information that, as far back as 1638, the governor of the Tobolsk region, "pursuant to an official deed," assigned the tasks of gathering, simultaneously with St. John's wort, cedar resin for use "in wounds and in bruises." The successful use by folk medicine in the past of cedar resin for therapeutic purposes for snake bites and for the healing of wounds was reported by V. M. Florinskiy (1880). At the present, scientists have established that cedar resin in fact possesses bactericidal and balsamic properties. It is less inclined to drying out in comparison with pine resin, and is less subject to crystallization. 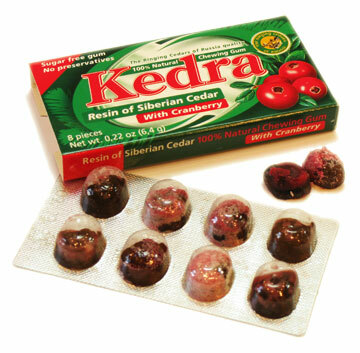 Folk medicine in its centuries-old practical work always used Cedar Resin (Pine Resin) with Cranberry. Cuts and wounds were covered with resin. The most serious and most chronic tissue injuries, up to gangrene, were treated using cedar resin. It was applied to abscesses as a softening, extracting, and healing remedy. In fractures, the area of the injury was rubbed with resin - and the bone knit more quickly. Resin was used in the treatment of purulent wounds, boils, and burns. In contrast to resins of other coniferous species, cedar resin does not crystallize for a long time, and does not lose its bactericidal qualities. Local people also used Cedar Resin internaly - in ulcers of the stomach and duodenum, pulmonary tuberculosis, and pneumonia. The literature contains information how Russian healers used resin for treating cancer. Cedar resin is of very high-quality, it contains approximately 30% turpentine and 70% rosin. The turpentine (essential oil, turpentine oil) obtained from Cedar Resin (Pine Resin) with Cranberry contains 80% pinenes, which are the source material for the synthesis of camphor - a remarkable substance that stimulates the activity of the respiratory and cardiovascular systems. Camphor is used in the treatment of diseases of the nervous system and schizophrenia, it is a constituent of many modern medical preparations, including those that stimulate nervous activity. Turpentine finds an even wider application, especially in folk medicine. It is used in massages in cases of rheumatism, gout, neuralgia, catarrhal diseases of the respiratory organs, in the treatment of wounds, and in a number of other cases.